Johns Spirit trainer Jonjo O’Neill will be looking at the omens with interest as his horse gears up for the Stewart Family Thank You Gold Cup (December Gold Cup) this Saturday. Thanks to his win in the Paddy Power Gold Cup last month, Johns Spirit has the chance to become the sixth horse to bag the Paddy Power-December Gold Cup double. The November race has proven to be a great indicator for the December Gold Cup, with five of the last eight winners having run well in the race. Add to that the fact that 33 of the 43 winners in the race’s history have come in from single-figure runners and O’Neill will be licking his lips in anticipation. He knows that it will not all go his way, however, as a class field will line up alongside his charge on Saturday afternoon. The best place to have a bet on the 2013 Stewart Family Thank You Gold Cup is with Bet365.com. The odds below were taken from the site, and you will be able to find the latest race odds there as well. Bet365.com is also offering each-way betting on the race, with which you will receive 1/4 if should your selection place in positions one to three. Chief among his contenders in this tight field might be Colour Squadron, the horse Johns Spirit beat to the line in his Paddy Power victory. The only difference, by no means negligible, is the fact that O’Neill’s runner will be carrying 9lb extra on Saturday, a consequence of that win. Perhaps for this reason veteran jockey has opted to run Colour Squadron on Saturday, choosing him over other JP McManus runners, Tap Night and Cantlow, who he rode to victory at Newbury a couple of weeks ago. Also worth looking at is Emma Lavelle’s Easter Meteor, who was running strongly and in the lead before falling in the final stages of the Paddy Power. Coming into the race at 12/1, the seven-year-old seems to be the value choice for the race. He followed up the Paddy Power disappointment with a strong second – to Cantlow – at Newbury. ‘He seems to have come out of Newbury in really good order and he loves it around Cheltenham. All those races are massively competitive, but he’s knocking on the door and it would be lovely if he could get his head in front,’ Lavelle said. The going at Cheltenham is expected to be Good for Saturday’s race. The race is scheduled to start at 15:25 local time. As mentioned above, the best racebook to place a bet on the 2013 Stewart Family Thank You Gold Cup is Bet365.com, who will offer the best odds on the race. When visiting Bet365.com, click on ‘Horse Racing’ in the left sidebar and scroll down to the Antepost section of the page, where you will find the markets for this race and many more. The Stewart Family Thank You Gold Cup (December Gold Cup) is a Grade 3 handicap chase for horses aged four and older, and is held at Cheltenham Racecourse in England. 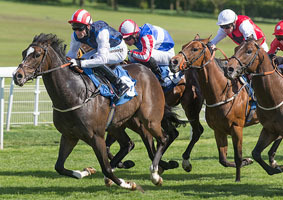 The race is run over two miles and five furlongs and has a purse of GBP 100,000, with GBP 57,000 going to the winner.